The LL.M. in European law offers students the chance to take part in the European Law Moot Court. 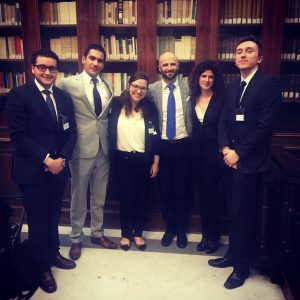 Since 1989, this prestigious international competition has allowed thousands of students enrolled in European and American universities to work with a made up case that raises complex and controversial issues of EU law. Each team, which is made up of three or four students, supervised by a coach if necessary, submits written dissertations (applicant and defendant written pleadings). At the end of this written phase, the teams that have submitted the best dissertations qualify for the oral phase consisting of pleadings in French and in English in the context of one of the regional finals. For two days, the teams will compete before a panel of specialists with recognised expertise in EU law (lawyers, professors and civil servants of the EU institutions). For more information about the competition, feel free to look on the website.